Galician Hebraist; flourished in the first half of the nineteenth century. He was one of the wealthy Hebrew scholars of that part of Poland who contributed much to the spread of knowledge among their brethren, and whose work in the field of Neo-Hebraic literature was a true labor of love. 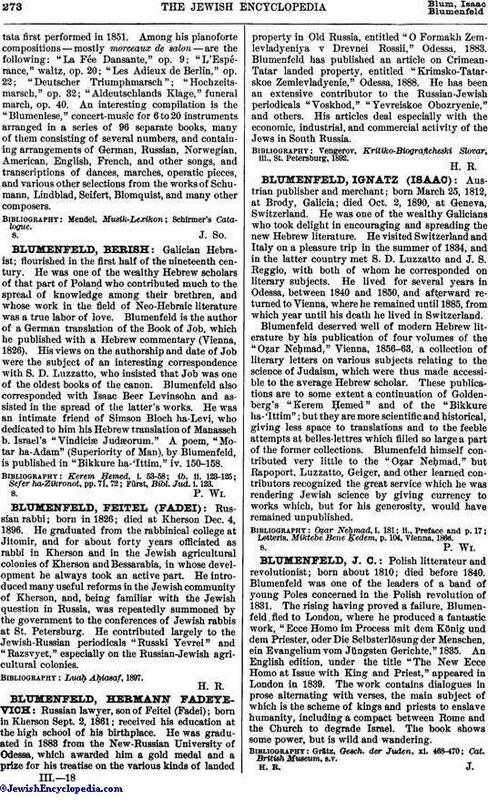 Blumenfeld is the author of a German translation of the Book of Job, which he published with a Hebrew commentary (Vienna, 1826). His views on the authorship and date of Job were the subject of an interesting correspondence with S. D. Luzzatto, who insisted that Job was one of the oldest books of the canon. Blumenfeld also corresponded with Isaac Beer Levinsohn and assisted in the spread of the latter's works. He was an intimate friend of Simson Bloch ha-Levi, who dedicated to him his Hebrew translation of Manasseh b. Israel's "Vindiciæ Judæorum." A poem, "Motar ha-Adam" (Superiority of Man), by Blumenfeld, is published in "Bikkure ha-'Ittim," iv. 150-158. Fürst, Bibl. Jud. i. 123.